Join us for an evening of samples, yummy treats, door prizes and discount shopping at our Vancouver warehouse on Thursday, November 24th from 6pm to 9pm. 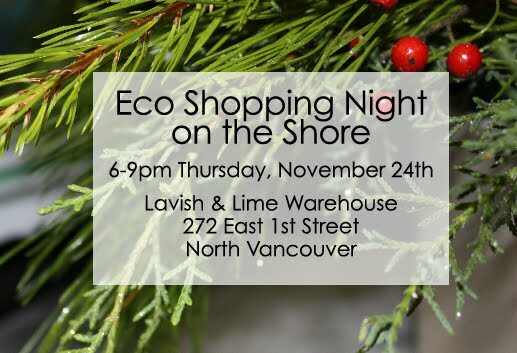 Bring a friend and browse our eco collection of unusual Christmas gifts in person at 272 East 1st Street, North Vancouver - just off Lonsdale and minutes from the seabus. Enjoy delectable desserts from our favourite local restaurant, Ethical Kitchen & bubbles too (the kind you can drive home with). Plus we'll be giving away door prizes and some of our favourite manufacturers will be on hand to answer questions and hand out free samples, including Phillip Adam, creator of our new Apple Cider Vinegar Shampoo. He has 50+ years in the beauty industry and will be happy to answer all your hair care questions. You'll save big on any purchases you make plus we'll be offering spotlight deals on specific products, including 50% OFF our entire felt jewellery collection. Come celebrate getting in the Christmas spirit and save! Feel free to give us a call with any questions, 778-340-5463. Hope you can make it! Great night. Got lots of my Christmas shopping done. Macaroons were fabulous. Hope you'll do something like this again. Thanks for coming out - we really appreciate it! It was a great night thanks to Ethical Kitchen for providing the treats and Phillip Adam for enlightening us all about the benefits of apple cider vinegar shampoo.